An aerial view of the excavation site, captured from Ken Stuart’s incredible 3d panorama. I’ve added links (see menu to the right) to three absolutely stunning 3d panoramas created, last year, by one of the diggers, Ken Stuart. 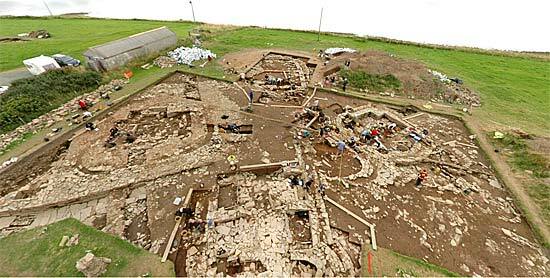 Two of the panoramas feature the Ness excavation site, while the third is the interior of the Cuween Cairn, just outside Finstown, in Firth. The Ness of Brodgar “images” are of the interior of Structure Ten – the Neolithic “Cathedral” – and an aerial view of the site. Once the panorama has loaded, use your mouse to scroll around the site. On a PC, use CTRL and SHIFT keys to zoom in and out. On a Mac, use CMD and SHIFT.